"This government is determined to build a housing market fit for the future. Tenants across the country should not be stung by unexpected costs. "That’s why we’re delivering our promise to ban letting fees, alongside other measures to make renting fairer and more transparent." The new measures are subject to Parliamentary timetables and will be introduced in law next year. The Tenant Fees Bill builds on government’s work this year to protect tenants and landlords through the introduction of new rogue landlord database, banning orders for rogue landlords and property agents as well as a new code of practice to regulate the letting and managing agents sector. All proposals relate to England only. 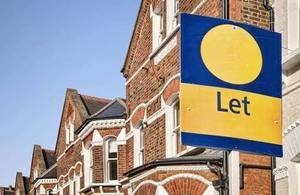 The ban on letting fees will apply to assured shorthold tenancies and licences to occupy in the private rented sector. A ban on letting fees was announced at Autumn Statement 2016, it was also a commitment in the 2017 Conservative Manifesto. The Tenant Fees Bill reflects feedback from the recent public consultation, which ran from April to June 2017 and received over 4,700 responses. 58% of respondents (93% of tenants) agreed with government’s proposed approach to ban letting fees to tenants with the exception of a holding deposit, refundable tenancy deposit and tenant default fees. A draft Tenant Fees Bill was published by government on 1 November 2017 and underwent pre-legislative scrutiny by the Housing, Communities and Local Government Select Committee who published their report on 29 March 2018. The Committee agreed that the Bill has the potential to save tenants in the private rented sector hundreds of pounds as well as making the market more transparent. Government has carefully considered the Select Committee’s report and accepted the majority of their recommendations. Read the government response to the Select Committee report.